I’ve been a fan of Piet Hein Eek‘s work since I spotted his designs in Elle Decoration a couple of years ago. I really admire the fact that he can create beautiful objects and furniture out of reclaimed wood using his design skills and craftsmanship to create something really unique. I also love this whole approach to create a more eco-friendly design and his commitment to only use reclaimed wood. Surely, this can only have a positive impact on our lives, our homes and the world of design in general. 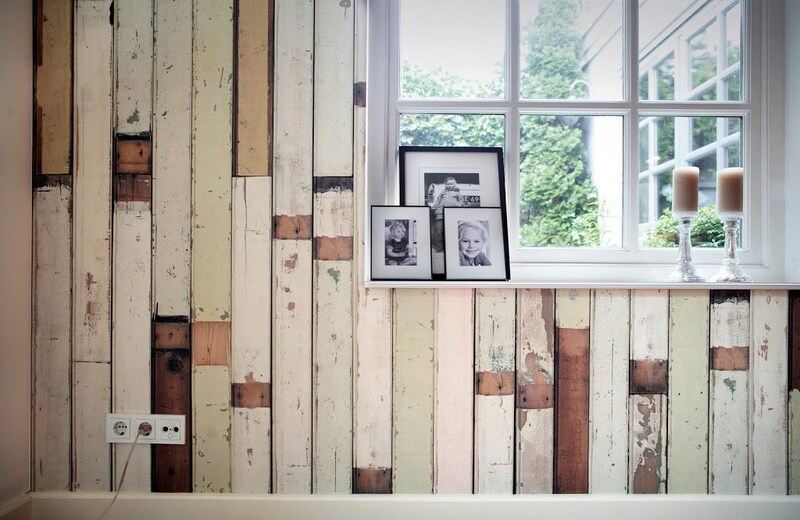 Inspired by his furniture design using reclaimed wood, Piet Hein Eek has designed a collection of Scrapwood wallpaper which has the same warm, rustic feel that real wood brings to a room. Each roll can easily cover up to 4 sqm which makes it ideal to create a feature wall like the one I made in our guest bedroom or re-invent a corner in your home, an office space or a wardrobe. Other projects using reclaimed wood that caught my eyes are this headboard made by House Tweaking and this Pallet chair by Studiomama which one day, I’m hoping to make for our Summerhouse. What do you think of this wallpaper? Do you love it or it doesn’t do anything for you? Love his work, and would love a couple of his stools in my kitchen!! You blog is amazing! Just found you! I love it and can’t wait to follow it! I like this architecture style. Attractive timber design. An intelligent work. Thanks for posting. That’s really amazing, it looks so real! I love this! It’s so hard to believe that it’s wallpaper! Incredible – love it. Thanks for posting.